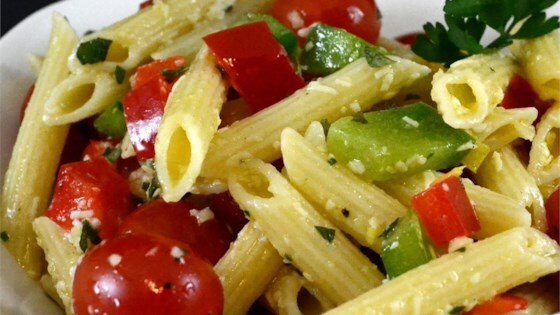 "This is truly a must have pasta salad especially if you are Italian. I can't keep this in the house, it goes as fast as I make it. Enjoy!" Bring a large pot of lightly salted water to a boil. Add pasta, and cook for 8 to 10 minutes, until tender. Drain, and transfer to a large bowl. Stir in enough olive oil to coat, but not so that it pools at the bottom of the bowl. Mix in the red and green bell peppers, tomatoes, garlic, salt, pepper, basil, parsley, oregano and Asiago cheese. Mix in the Parmesan cheese. Refrigerate until 20 minutes before serving. If the pasta soaks up a lot of the oil, you may need to add more. Taste the salad as you are preparing it, you may like more or less ingredients. This Penne Pesto Pasta Salad tastes just as good as it looks. Delicious. My husband loved it, and he usually isnt a huge fan of pasta salads. I didnt put quite as much bell pepper, and oregano to taste. Will make this again. This is good, but it needs a little something to add a zip. I splashed some balsalmic vinegar to taste and that made all the difference.